Editor's Note. This species is was described in 2011 as Baryancistrus xanthellus. While the l-number discussion below is more or less obsolete, I've left it unaltered as it was written some eleven years before the description and still holds up quite well! It is also both interesting and useful to see where we've come from too. X marks the spot where collectors struck gold! The problem, if you could call it that, with the maps below is that there is more than one "X". There are in fact 3, this is because there are at least three gold nugget plecos. Oh, and they have 4 "L" numbers among them too. Although X marks the spot each one is between 80 and 100 miles away from its nearest neighbour. 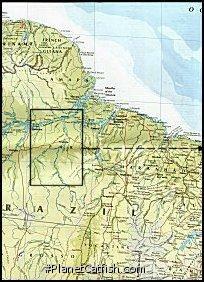 Perhaps "X" is for the Rio Xingu rather than precise locations! 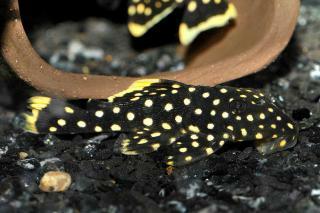 Anyway, L18, L81, L85 and L177 are all gold nugget plecos. The table below will hopefully help with identification. What you have to bear in mind is that the comparisons are only really useful when comparing similarly sized fish and that individuals patterning is very variable anyway. Aqualog's original Loricariidae - All "L" numbers actually has a good trio of pictures showing juvenile, sub-adult and adult of L18/L81. Look up L85 for these pictures. It should be noted that the pictures in Aqualog for all these L-numbers are accurate and good representations of the original fish. Alright so far, but what are the factors that differentiate these fish? The following table should help. L018 This is the "common" gold nugget with medium sized spots. This is a picture of a juvenile. 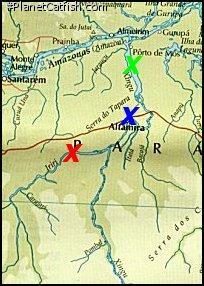 L018 is found in area around Altamira on the Rio Xingu. This is about 75 miles downstream (North) of where the Rio Iriri joins the Rio Xingu. L081 This is the small spot gold nugget from the lower Rio Xingu. 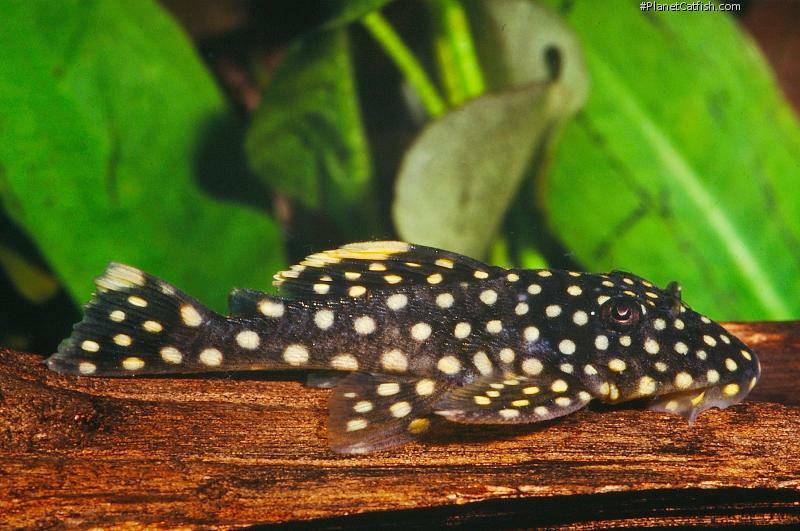 The yellow colouration on this fish (spots and fin seams) tends to be paler. This is a picture of a young sub-adult. L085 These are adult L18, they are one and the same fish. The adult colouration is markedly different however. This is a picture of a young adult. L177 This is the big spot gold nugget from the Rio Iriri tributary. 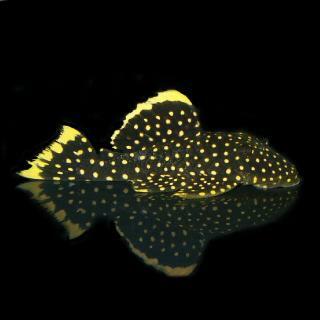 The yellow colouration on this fish (spots and fin seams) tends to be a stronger yellow. This is a picture of a juvenile. Arguably the most cosmetically pleasing of the gold nugget tribe. This all seems relatively straightforward, Corydoras keepers have been doing this sort of thing for years, right? Well, not exactly. The individual fish can also change colour - exactly the same fish as pictured on a dark piece of wood against a light background will look very different seconds later because it is now sitting on lighter gravel out in the open. With identification being such a fraught, tentative process, it is perhaps reassuring to know that care of all of these fish is somewhat simpler if not less demanding. Etymology Greek, barys = heavy + Greek, agkistron = hook - Essentially "Heavy Ancistrus". From the Greek xanthellus, yellow, in allusion to the bright color of the specimens. 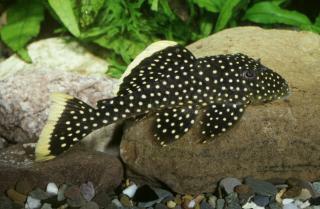 - Shane's World Catfishology The yellow seamed “Golden Nugget” – a problem pleco? 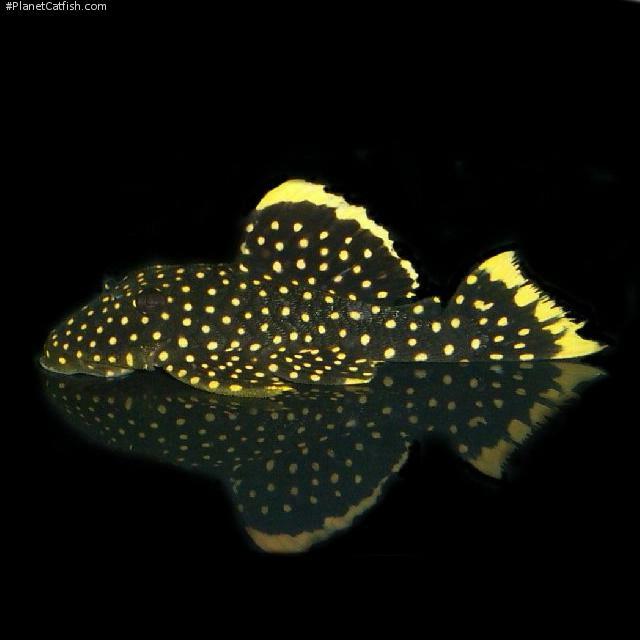 Identification With the exception of L081 (not mentioned in the description of B. xanthellus), the combination of yellow markings on the dorsal and caudal fin and numerous yellow spots on the body is specific to this species. L177 is a variety with larger spots more obvious in younger specimens and LDA060 is a variety with ill formed spots or flakes. Sexing Dimorphism is difficult to notice unless the fish are at full breeding size. Males have a flatter, more levelled slope to their foreheads and are slightly wider about the head. Females have a more rounded forehead and are slightly plumper at the mid body when in spawning condition. There is no noticeable difference in odontodal growth in either gender. Distribution This species has been recorded from the area called Volta Grande do rio Xingu, an area immediately above Belo Monte falls, and from rio Iriri, the larger tributary of rio Xingu. L177 is from further upstream near the where the Rio Iriri joins the Xingu. Feeding These fish are grazers, but not in the sense that they eat only vegetation. They actually sift and chew at the film of organic matter on hard surfaces in search of higher protein foods. In the wild this would constitute mainly of algae and vegetable matter, but with a variety of foods from small insect larvae and crustaceans to other animals eggs. With this in mind, a largely vegetarian diet, cucumber and courgette appear on the accepted menu, with treats of frozen foods such as bloodworm and blackworm, along with frozen prawns. Algae and plants are avoided. Accepted food morsel size changes with age in all of these fish. Best results are obtained by offer these foods in a paste. The very long intestine of these fishes indicates a biology adapted to breaking down food high in vegetable content. Breeding Well documented breeding in captivity has been accomplished once. The fishes had a very specialised diet of blended meat, fish and vegetables and were kept in a large aquarium with lots of current, high DO and spawned at 30°C. The free swimming fry were fed the same food to raise them. References Neotropical Ichthyology vol.9 no.2, pp 242, Figs. 1-2. There are 421 registered keepers, view all "my cats" data. There are 9 wishes to keep this species, see who wants what. There are 24 records of this fish being seen, view them all.